Get more comfortable and productive while you work. Our quiet height adjustable desks allow you to sit or stand at a whim, without disturbing others. 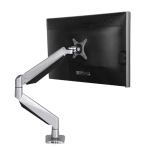 Boost your productivity with our stand up desk accessories. Competitive volume discounts and corporate pricing. Request a quote for your project. Our premium dual motor frame with 3-section square leg which allows for a lower start point and a higher standing position giving you more versatility vs. a 2 section leg. 3rd gen redesigned quiet motors, improved motor insulation and load protection. LED height readout with 4 user programmable heights. 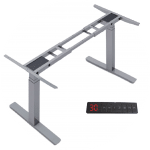 Three leg stand desk with adjustable angle from 90 to 180 degrees. LED height readout with 3 user programmable positions. Each side of the frame has removable section to facilitate a large width range.